Parcel is the first project under the Flat Rate Exchange Design moniker and based on the parameters of the flat rate mailing options through USPS and FedEx. These simple three legged stools can be used individually or connected to each other to create tabletop surfaces and bench seating. The faceted shape of the seat and toggle connection system allow the user to take part in the creative process by organizing the stools into multiple shapes and sizes for varied functions. The threaded tenons of the legs easily screw into the top seat surface, which allows for quick assembly and breakdown. 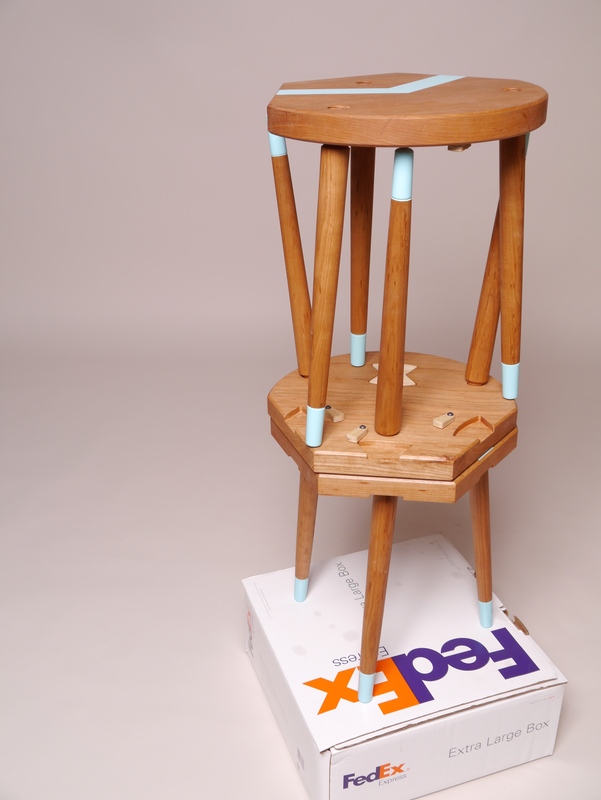 The stools are packaged and distributed in units of three in a FedEx Express Extra large One Rate Box. Designing for flat rate shipping allows us to distribute our products easily, efficiently, and cost effectively while providing a set of physical parameters in which to design and create. ← At Long Last, a ‘Flat Rate Exchange’ Exhibition!